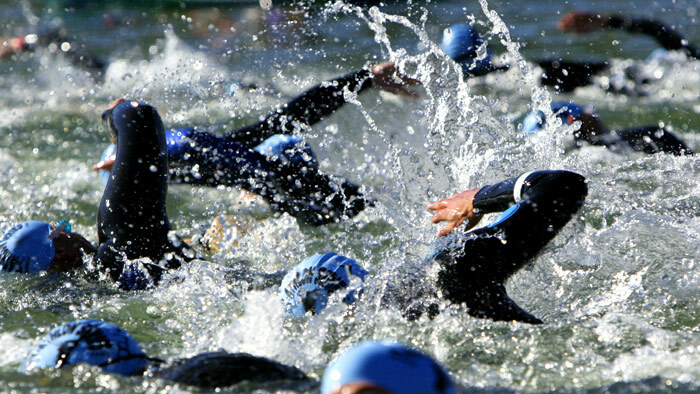 Your first triathlon can be exciting and overwhelming at the same time. I’m a firm believer in putting in the work first, then reaping the rewards. The race should be something to enjoy, knowing you are prepared and that you are embarking on a new journey. If you prepare correctly, you’ll feel that way from start to finish. Yes, you’ll be nervous, but that’s the fun part of trying anything new. Here’s my list of five simple tips to help you on race day. Give these tips a once over as I’m sure they’ll help you come race day. Make sure you know how to swim and know how to swim in open water. Swimming in the pool is one thing, swimming in the open water is a completely different skillset for someone new to swimming. Make sure you get to a body of water with a friend and try swimming in open water well before race day. If you have the opportunity, get with a friend or coach who can help you with your swim stroke. The more efficient (not fast) you are on race day, the easier the race will be for you overall. You can waste a lot of energy in the swim with poor technique. Not just physically fit, get fit on your bike too. The type of bike you ride on for your first season of triathlon doesn’t matter, but it has to fit right and it has to be operational. Triathlons have been going on for well over 40 years and triathletes have ridden everything from single speed cruisers to high-end triathlon specific bikes. Whatever type of bike you ride, make sure it fits you correctly and make sure the brakes, gearing, wheels and headset are all in great working condition. You don’t want to get stuck in the wrong gear on a steep hill because your bike doesn’t shift and you certainly don’t want your headset and handlebars to come loose on the other side of that steep hill. A certified bike fitter can tell you if the bike is the right size for you and help you get as comfortable as possible on your bike. A good mechanic can give your bike the once-over to make sure it’s all working properly. Many people will tell you to run without socks. If you are contending for an Age Group prize this may mean the difference between the podium or not, but for someone racing their first triathlon, I would advise against this. Even the most experienced racer should practice sockless running quite a few times before attempting this on race day. The downside if you don’t heed this advice is typically some raw skin on the back of your Achilles and your shoes will have a nice big blood spot on the back. On the topic of gear, there are some extra little bits to have that can help. Make sure you have sunscreen, body glide for your wetsuit, an extra pair of goggles and everything else on this race day checklist. Yes, an easy one, but don’t let race day be the first day that you run out of the water after swimming 750m, then attempt to take off a wetsuit. Also, don’t let it be the first day that you try to mount your bike in a hurry or run immediately after biking for 12 miles. Practice transitions for at least 15 minutes on 4 separate occasions. If you have to skip a workout to do this, I’m giving you permission. Be prepared and know what you are up against. You won’t know how to execute a good transition unless you practice them a few times. In the weeks leading up to your event, take a day to practice your race. Set up your bike and run gear like you will before the race. Maybe you can do this at your house, the pool or at the local beach or pond. Go out and swim at least 80% of the race distance, about 600m, and then come out of the water and take off your wetsuit and proceed to your bike. Put your bike helmet on, your bike or run shoes on, and sunglasses and go ride 8-10 miles. After the bike you can practice your second transition. Get off your bike, take off your helmet, put on your run shoes and start running. You will immediately notice that your legs feel awkward from riding the bike, but that will go away. If you don’t know what this feels like before race day it will be an unwelcome surprise. As you gain experience, you’ll learn the long list of tasks that will allow you to race more comfortably and efficiently as you move from your first race to your second and so on. There is a lot to learn, but knowing what to expect is half the battle! Good luck and have fun!